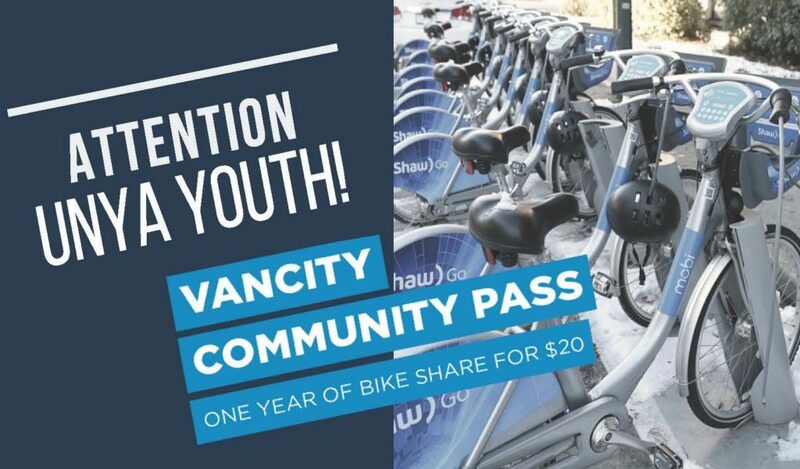 UNYA can now refer youth to Vancity’s Community Pass program so that you can receive a yearly Mobi by Shaw Go yearly membership for only $20. Use the Mobi bike share to commute, run errands, visit friends, or just take a ride around the city. A Mobi membership will allow you to have access to unlimited 60-minute bike sessions for an entire year! Mobi bike share is a service that makes public bicycles available to individuals on a short-term basis. The bikes can be unlocked from one station and returned to any station in the system, making bike share ideal for short, one-way trips. You can find these Mobi stations across Vancouver, from Vine Street to Victoria Drive, all the way from Stanley Park to 18th Ave.
Popular ways to use the bike share are to commute, run errands, visit friends, or just casually cruise around the city. * Please note that usage over the 60 minute session will accrue extra charges – remember to dock your bike before 60 minutes are up to avoid overage charges! Bikes can be renewed after your 60 minute session has ended.